Our mission is to educate, inspire, and empower youth and families through the magic of mother nature. MeWater Foundation is a nonprofit 501(c)(3) organization run by surfers and mental health professionals in the San Francisco Bay Area. 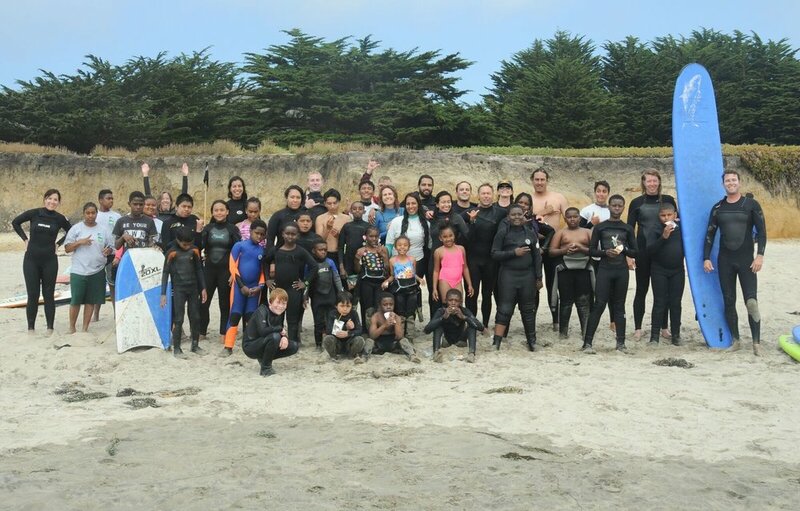 We provide day and overnight surf camps to youth, families, and groups, with a mental health approach to mindfulness, empowerment, and exposure to the ocean and the great outdoors. MeWater Foundation was founded in 2015 by childhood surfing friends Eddie Donnellan and Tim Gras from San Francisco. They have always shared deep personal connections with the ocean and have found council in surfing through life’s biggest challenges. Eddie and Tim worked together for over two decades at the Edgewood Center for Children and Families, specializing in trauma informed care and running outdoor summer camps. It was there that they had the idea to bring the kids and others out into the ocean. When they saw an immediate positive impact on kids dealing with a variety of issues, they decided to take the plunge, officially founding MeWater to bring more kids to the beach. From their experience, they have learned to take a unique and prescriptive approach to working with every child they serve through MeWater. Their passion for helping children and families is the driving force behind their mission. In addition to Eddie and Tim, MeWater is supported by an incredible staff of volunteers – like-minded mental health professionals and surfers, all with a passion for helping children, and all working to continue MeWater’s vision of taking outdoor youth programs as far they can, always with an emphasis on educating, inspiring and empowering the youth and their families. MeWater Foundation works to address adjustments of trauma and stress in young people from backgrounds of poverty and violence by providing a different way of relating to the world and communities they live in, all through the power of nature and the ocean. MeWater connects vulnerable young people to positive community members and creates opportunities for youth to develop new skills, practice new coping mechanisms and form positive, reciprocal relationships with trusted peers. From May through November, MeWater runs programs throughout the Bay Area, including day and overnight camps for youth with a mental health approach to mindfulness, empowerment, and exposure to the ocean and outdoors. MeWater Foundation is more than surfing. It is about increasing one's own self-reliance and purpose. It is about leveraging the strengths of people and reducing social isolation by growing positive connections within the community with the ocean as a conduit to improvement of well-being. Young people growing up in challenging circumstances often experience barriers to accessing the emotional support they need to cope with the pressures of daily life. The constant stress of under-resourced communities often results in behavioral and learning problems, the increase of social isolation, and a need for realistic opportunities to enable young people to prosper. MeWater Foundation is dedicated to promoting positive behavior and health in children who suffer or have suffered severe trauma while providing them a glimpse of new opportunities and perspectives. MeWater works to create moments to chip away at Adverse Childhood Experiences (ACES) and the scars of trauma. Targeting children the system may be failing and who need supplemental support, MeWater Foundation acts as an additional resource to positively impact youth with its trauma-informed care. MeWater has active and robust relationships with local community partners to serve the children who need its services the most, including the Boys and Girls Club, YMCA, Hunters Point Family, and the Edgewood Center. MeWater is a 100% volunteer-run organization. You don't have to know how to surf to help kids have a life-changing day at the beach. Join us at our next surf day or donate to make a difference!